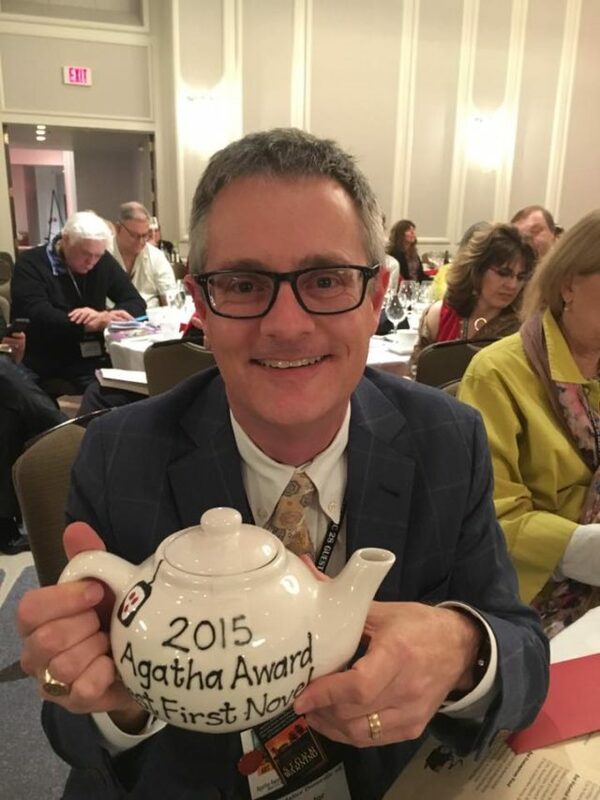 As I said Saturday night in accepting my own Agatha, I have plenty of people to thank for their support of my work: Donna Andrews, Janet Hutchings and Margaret Maron, who provided blurbs for the book but more importantly endless support throughout my career; Alan Orloff, who has been a great friend and great first reader every step of the way; and Kendel Lynn and Rachel Jackson at Henery Press, without whom my book would not only not exist but certainly wouldn’t be the book that it is. It was terrific hanging out at the banquet with a table full of supportive friends: Alan, LynDee Walker, Paula Gail Benson, Gerald Bartell, Susan Shea, David Burnesworth, Mo Walsh, Janet Costello and Helen Nelson. Hope they had as much fun as I did! And the weekend itself was tremendous fun—seeing too many friends to list here, but a handful of stand-out events as highlights of each day. Friday included Malice-Go-Round, lunch with the Guppies, moderating the Best Short Story panel (and congratulations again to Barb Goffman! ), the Henery Press cocktail party, a dinner in honor of B.K. Stevens (but sadly without Bonnie herself), and then the signing for the Malice Domestic: Murder Most Conventional anthology—with dessert! Saturday was a Sisters in Crime breakfast (with a shout-out about my work with Debra Goldstein and Deborah Lacy on SinC’s new short story initiative), the panel for Best First Novel finalists, lunch with those same finalists (a fun bunch! ), and then a signing for the new Chesapeake Crimes: Storm Warning anthology at the Wildside Press table before the big Agatha Awards banquet (and a wee bit too much to drink after that). It was a great weekend overall. Thanks to great friends for all their kindness and support. And thanks especially to the Malice Domestic board and volunteers for all their hard work: Verena Rose, Janet Blizard, Caroline Craig, Joni Langevoort, Marian Lesko, Anne Murphy, Rita Owen, Janet Powell, Harriette Sackler, Shawn Reilly Simmons, Tonya Spratt-Williams, and Angel Trapp. A hard-working group of women there, a wonderful and unforgettable event. And can’t wait until next year!